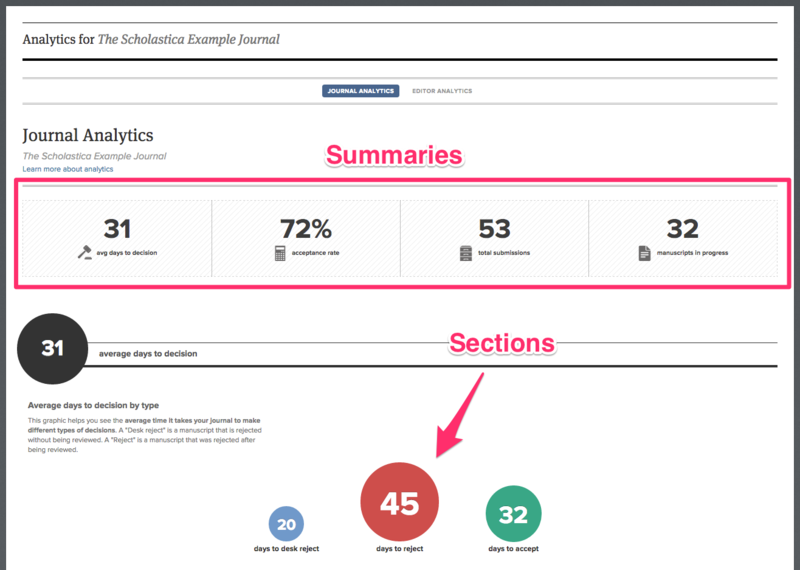 Scholastica provides peer review analytics for journal editors so they can easily review their journal's performance. Journals that use Scholastica OA Publishing also have access to Publishing Analytics. 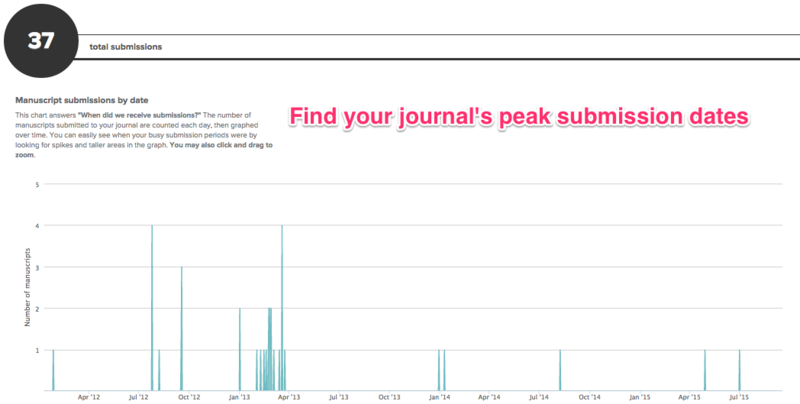 Editors can access journal peer review data by clicking My Journals and then clicking the Analytics tab. 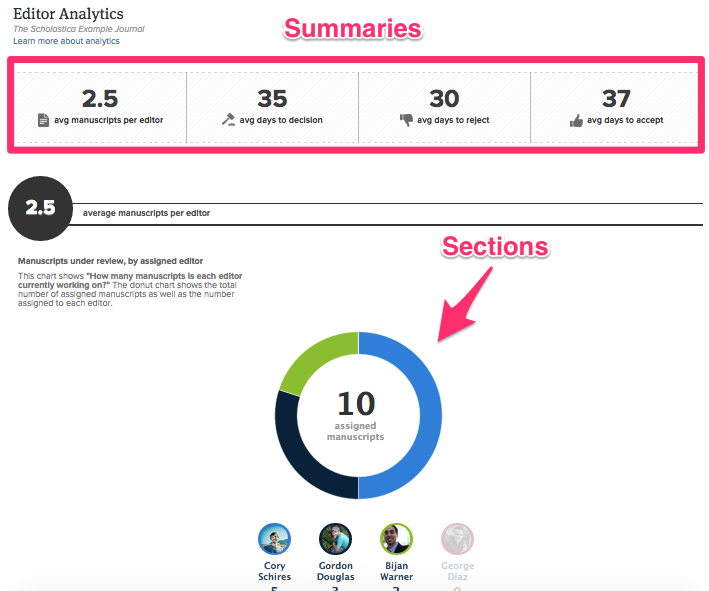 The "Journal Analytics" section shows information about the journal as a whole, while the "Editor Analytics" section shows information about individual editors. Each of these pages is broken up into four sections containing graphics that describe journal and editorial performance. Each section is summarized at the top of the page. Submission: a manuscript that an author submitted to a journal in order to receive a decision as to whether the journal will publish the manuscript or not. Manuscripts in progress: a manuscript is "in progress" from the time it is submitted until the time the journal makes a decision (see the "Under Review" manuscript status section of this article). Manuscripts with a decision and manuscripts that are withdrawn from consideration are not "in progress". How are different measures calculated in the "Journal" report? Days to decision by decision type: this distribution chart calculates the days to decision for each manuscript that has received a decision, broken up by decision type (accept, reject, and desk reject)​. You can quickly see how many manuscripts with a given decision type took a certain number of days. Acceptance rate: the average days to decision for all your manuscripts that have received a decision. Note that this does NOT include manuscripts that received a decision of "revise and resubmit". How are different measures calculated in the "Editors" report? To learn more about being an editor, check out our Editor Guide.